Pearl's expertise is all over this solidly-constructed, great looking and exquisite-sounding kit. Beautiful build, looks and sound. The Masters Premium Legend Kit features huge bass drum claws, telescopic spurs and Pearl's chunky Opti-Mounts. Thin, straight-sided 6-ply maple shells are built to encourage natural resonance. Five stock lacquer finishes are available with a further 27 special order options. Pearl's Masters Series has been in production for nearly 20 years and the Masters tag now covers two Pearl ranges, Masters Custom and Masters Premium. 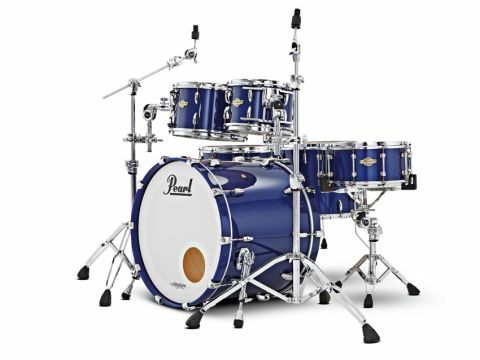 Masters Premium (where this kit is located) is further divided into two sub-ranges, Masters Premium Maple (MMP) and Masters Premium Legend (MPL). Pearl's system of nomenclature might suggest that MPL is the better of the two Masters Premium options; in fact both ranges are identically priced. What separates them is the shell construction. MMP drums are built around 4-ply maple shells with reinforcement rings while the review MPL kit is made with straight-sided 6-ply shells. Despite the difference in ply count, the MPL shells are only 0.4mm thicker than the equivalent MMP drums. "Pearl has interpreted an ancient mathematical formula in the positioning of the air holes." This is owing to the MPL plies being 0.9mm thick (with six making 5.4mm) while the MMP shells use alternating 0.9mm and 1.6mm thick plies (two of each ply totalling 5mm). Pearl has a long history of using the alternating ply technique so, by its own admission, creating thin shells from sheets of uniform thickness of ply is something of a new concept for the company. The 5.4mm shell is consistent across all the drums, including the bass drum and snare. Pearl describes the maple used as A-class and as being "sourced from the best maple available", but other than this, few details of the wood are available. Certainly the look and feel of the maple confirms Pearl's assertion, as the grain is both tightly packed and smoothly flowing. The standard of shell construction is also unquestionably high, with each drum being as close to perfectly round as could be expected. Pearl's overlapping scarf joints are a beautifully executed detail. Although a more involved method of joining wood, there are solid technical and aesthetic reasons for incorporating scarf joints and it's a pleasure seeing such a technique used. The shell's interiors are sealed with a clear lacquer while the bearing edges are precisely cut at 45° with a smaller 45° back-cut. Five stock lacquer finishes are available with a further 27 special order options, making 32 choices altogether. The Navy Blue Sparkle of the review kit is one of three new colour schemes, along with Matte Natural and Brooklyn Burst. Pearl's reputation for lacquer finishes is well deserved - the quality and depth of the lacquer is difficult to describe without getting into the realms of drum fetishism. Matching wooden hoops glitter at each end of the bass drum while the rest of the drums are fitted with Pearl's new Fat Tone hoops. A clever hybrid of triple flanged and die-cast hoop, they claim to offer the best of both worlds by taking a fairly standard flanged hoop design then folding over the top edge and welding it. The result is light (the hoops are 1.6mm thick) but the thicker top edge has the stoutness of a die-cast hoop. Pearl reckons that Fat Tone hoops hold their tuning, add clarity to rim-shots and cross-sticking, but don't influence the overall sound to the same degree as die-cast hoops. Elsewhere across the kit, details abound, such as the huge bass drum claws, telescopic spurs and Pearl's chunky tom Opti-Mounts. Another new design concept found on all of the drums is the Golden Ratio air hole. The Golden Ratio is an ancient mathematical principle based on proportions and Pearl has interpreted the formula in the positioning of the air holes. In practice this means that the air holes on toms and bass drums are found closer to the resonant head to increase low frequencies, while for snares the holes are nearer the batter head to accentuate attack. The review kit is based on a shell-pack made up of a 22"x18" bass drum, 10"x7" & 12"x8" toms and a 16"x14" floor tom, augmented by an additional 14"x12" floor tom and 14"x6 " snare. For such a large, thin-shelled drum, the bass drum produces very little in the way of overtones. With no dampening - only Remo Powerstroke 3 batter and ported front heads - it's deep and punchy but unwanted frequencies are minimal. With the heads tightened the sound becomes quite bright and buoyant, but the drum's power remains obvious. At lower tunings the note stretches out to Olympic dimensions but there is still an unmistakably taut feel to its response - it's all muscle and no flab. The toms are fitted with clear Ambassadors top and bottom and this combination produces almost velvety tones that are gloriously resonant. The sound of each drum can be picked out in isolation, even during flurries around the kit. Each note lingers on, fading cleanly, and by the time the larger floor tom is reached there is a near crescendo of toms humming in sympathy. When the kit was miked up and gigged, we had to apply a tiny bit of dampening to both floor toms to stifle some of the ringing, but in all other scenarios (including recording) these toms could be left wide open. Played softly they murmur, while increasing the dynamics reveals more richness and body. Here the Fat Tone hoops add a degree of attack as well. Swapping the supplied heads for coated Ambassadors dilutes some of the sheer presence in favour of a thinner, woodier sound. Twin-ply clear heads, meanwhile, saturate the already fat notes even further. In contrast to the other drums, the snare sports Pearl's all-new swivel tube lugs, sourced from the company's Reference Pure Series. The drum gives a similarly polished performance, possessing the sharpness of a metal-shelled drum with the added warmth of a wood shell. The Fat Tone hoops undoubtedly encourage its aggressive presence while also allowing the shell to breathe. With tension ratcheted into the head the drum is crisp and loud enough to loosen your fillings. Backing off the tuning relaxes the sound into a super-fat crunch that is equally penetrating. Again, only token amounts of dampening is required (if any) as the snare is finely balanced on the line between having an edge and being too uninhibited. Quieter playing is also well catered for, with gentle brushstroke and cross-sticking carried faithfully.